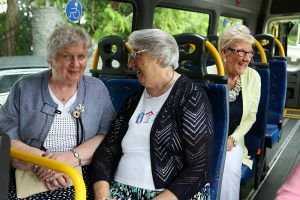 The Social Investment Fund (SIF) service is an extension of the Dial a Lift service and enables transport at evenings and weekends and allows for travel outside the operational area. Evening travel can be utilised until 8pm and 9am-5pm at weekends. Smart – pass concessions are not applicable on this service. 48 hours notice preferable. 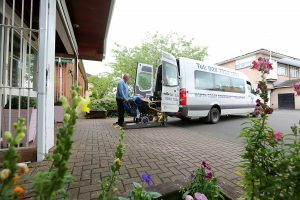 North Coast Community Transport delivers transport in the towns of Ballymoney, Coleraine, Ballymena and Limavady on behalf of Disability Action, Belfast. This urban service is for members of Disability Action not North Coast Community Transport and you must meet their required eligibility to become a member. Our Fleet of 20 vehicles cater for 16 passenger seats and are available to assist with any group transport including luncheon clubs, youth groups, church groups, afterschool clubs and women’s clubs. Each vehicle is fitted with on-board lifts to assist those travelling with mobility issues. Groups have an option of ‘with driver’ or ‘without driver’ bus hire but those hiring without must have a qualified, Midas (Minibus Driving Awareness Scheme) trained driver. NCCT can arrange and deliver MiDas training if required. Rates for ‘without driver’ hire are £30 half day (up to 5hours) or £60 full day (5hours or over) and £0.40p per mile. 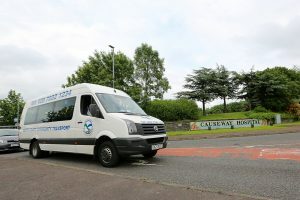 Please be advised that Minibus drivers must hold the correct category on their driving licence to legally drive a minibus and if you are unsure, contact our main office for guidance. North Coast Community Transport can also arrange larger group travel through our brokerage agreement with a local coach company.